Though we may not think of it often, the importance of a healthy gastrointestinal system is paramount to overall good health. From the intake and absorption of nutrients to the regulation of our blood sugar, the functions of our gut are vital to the rest of our well-being. In this post, we’ll explore the necessity of keeping our digestive tract in proper working order, what risks can surface when we don’t and what the best foods are for good digestion. Our bodies need energy and the ability to repair and build cells. A healthy gastrointestinal system is what allows this to happen. Without our digestive system in working order, a whole host of health issues can arise. Gastroesophageal Reflux Disease (GERD). Chronic acid reflux is commonly known as GERD. The condition happens when acid rises into the food pipe, and the person feels a burning sensation. Using certain medications like pain relievers and antihistamines can trigger reflux as well as behaviors such as eating just before bed, overheating, consuming high-fat or acidic foods or drinking alcohol. If GERD is not managed properly it can lead to much more severe issues including esophagitis and pneumonia. Irritable Bowel Syndrome. This condition is a long-term disorder that impacts the large intestine and causes bloating, gas, abdominal pain, cramping and diarrhea. In some cases, it can also cause constipation. Gallstones. When there is a chemical imbalance in the gallbladder, those excess chemicals can solidify into lumps known as gallstones, which can cause sudden and severe pain, nausea, vomiting and sweating. They can also trigger an inflammation of the gall bladder, which may require a cholecystectomy to remove it if the gallstones can’t be removed or dissolved. Celiac Disease. Those with Celiac Disease are unable to process gluten properly, which results in a reaction by the immune system that damages the small intestine. Peptic Ulcer. When stomach acid eats away at the lining of the stomach, or bacteria causes infection, a sore (often round or oval) can develop, which is called a Peptic Ulcer. Symptoms of a Peptic Ulcer include a burning abdominal pain, changes in appetite, vomiting, bloody stools and sudden weight loss. Medications can help eliminate the ulcers if caught before complications arise. Diverticulitis. When small pouches called diverticula, which line the intestine walls, become infected and/or inflamed, a condition emerges called diverticulitis. Nausea, chills, fever and severe abdominal pain can result from consuming foods that trigger the condition. Modifying your diet can help reduce and eliminate symptoms, and in the most serious cases, the diverticula can be surgically removed. Leafy greens. It may sound cliché, but if your parents forced you to “eat your vegetables” as a kid, they were on to something. 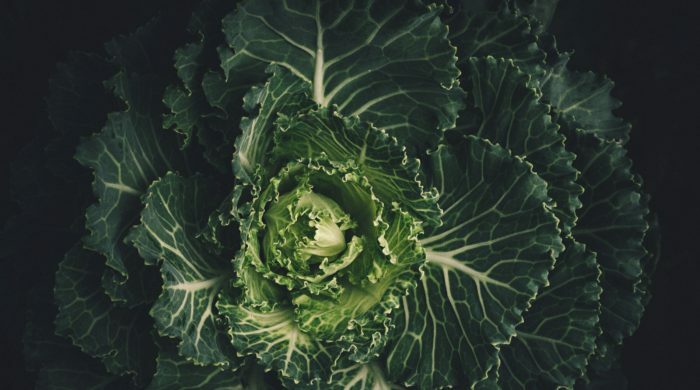 To get even more specific, eating leafy greens like spinach, cabbage and swiss chard will provide a high source of fiber in addition to adding important nutrients like Vitamins A and K, and folate to your system. The sugars contained in leafy greens also contain a microbiome that stimulates healthy gut bacteria. Fruits. If you eat a diet high in low-fructose fruits such as bananas and citrus favorites like grapefruit and oranges, you’ll reduce the chances of getting gas and reap the rewards of their fiber-rich makeup. Lean Proteins. Although you should avoid them fried, lean proteins such as turkey, chicken and fish are a lower-risk food choice than red meats and can promote colon bacteria. Whole Grains. A healthy dose of fiber is vital to maintain good gut health and whole grains provide just that. They are superior to pasta and regular breads because they contain such a high amount of fiber and additional nutrients. Fermented Foods. Incorporating fermented foods such as sauerkraut or kimchi are helpful to your gut, because they produce a good bacteria that stimulates digestion. The Western Washington Medical Group Gastroenterology specialists can help screen, diagnose and treat digestive health ailments. Reach out to them to get your questions answered. Or, for general inquiries, complete this form.